It was in 2008 that we were alerted by tourists visiting the Alghero Aquarium in Sardinia, Italy. 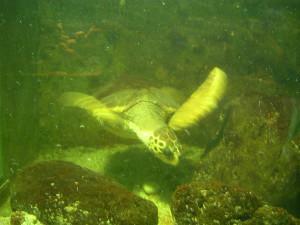 They reported about the appalling conditions under which two loggerhead turtles were held at the Aquarium. The Born Free Foundation also followed the tourists’ email complaints. We immediately contacted the curator of the Naples Aquarium at the “Stazione Zoologica Anton Dohrn” (SZN) in Naples, Dr. Flegra Bentivegna for help. The two turtles were held at the Aquarium, respectively, for 30 and 20 years. The turtles were seized at last in 2011 by the local authorities and were transferred to Oristano, Sardinia, to the Sinis Rescue Centre (CRES) at the IAMC-CNR laboratory (Institute for Coastal Marine Environment – National Research Council) and placed in a 3,000 lt. rehabilitation tank. Both turtles were suffering from malnutrition, were underweight, their shells were covered with algae, parasites and injuries. The absence of natural sunlight in the subterranean structure where the two turtles were kept in captivity in a small tank, caused them to have calcium assimilation deficit. Since rehabilitation started, their weight has increased, their diet is regular in quantity and quality. The turtles will soon be transferred to a 14,000 lt. tank for locomotory rehabilitation and their pre-releasing phase. CRES plans to release the turtles in the future and to monitor their migratory routes through satellite tracking in collaboration with the SZN. When people care enough to pass along information, then we can act!